Whether the busy season is just around the corner, or you’re right in the middle of your busiest time of year — having a plan to make the most of your online marketing programs is the clearest path to success. That’s why we’ve put together this checklist. How will new customers find your business online? How will you stay top-of-mind and build relationships with new and existing customers? How will you get customers to come back and do business with you again and again? How will you encourage them to tell their friends/connections about your business so you reach new customers? How will you evaluate your success and make smarter choices? Once you answer one of these questions, you’ll quickly find that answering the others becomes simpler over time. Whether you’re brand new to the concept of online marketing, or an experienced marketer looking for ways to do more business — this easy-to-follow checklist can help. 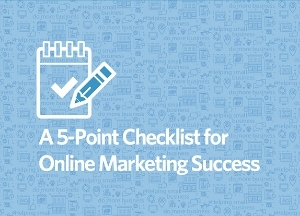 Get your copy of the 5-Point Checklist for Online Marketing Success today! If you have any questions about the information in the guide, or need help with any of your online marketing challenges, let us know! Post your questions in the comments below.